June 22, 2017: Like the Nile River Valley, the Indus River Basin in Pakistan is an ancient seat of civilization. People have lived and farmed in the river’s fertile floodplain for millennia, in spite of the arid conditions that make it difficult to grow food in the rest of the region. 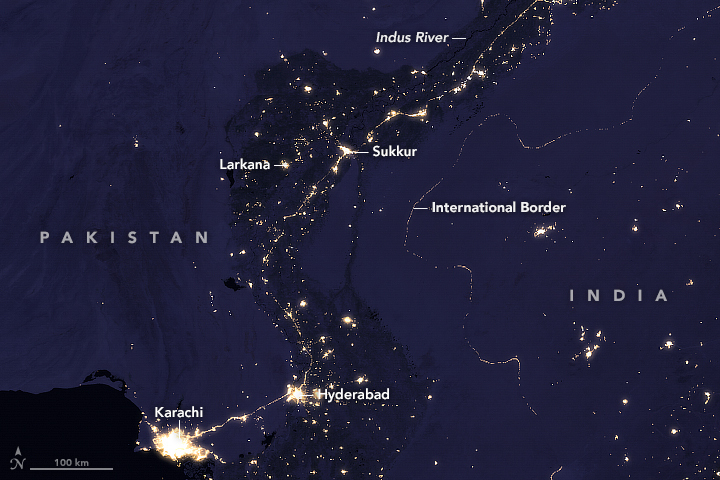 In modern times, the sinuous shape of the Indus River emerges even in nighttime satellite imagery. Though the river itself is only barely visible, the dark crops and vegetation growing along its banks help reveal the general shape of the river. The brighter, more reflective land beyond the dark band of farmed land is desert. The image is based on data collected in 2016 by the Visible Infrared Imaging Radiometer Suite (VIIRS) on the NASA-NOAA Suomi NPP satellite. It is part of a global composite that was made by selecting the best cloud-free nights in each month over each landmass on Earth. VIIRS includes a special “day/night band,” a low-light sensor that measures light emissions and reflections, allowing researchers to distinguish the intensity, types, and sources of night lights and to observe how they change over time. Many of the largest cities and towns in Pakistan are clustered along the Indus. Karachi, a city of 9.3 million people, lies along the southernmost stretch of the river, near where it empties into the Arabian Sea at the Indus River Delta. Other bright cities along the river include Hyderabad (1.1 million people), Larkana (270,000 people), and Sukkur (300,000 people). The border between Pakistan and India stands out among the night lights of this region. 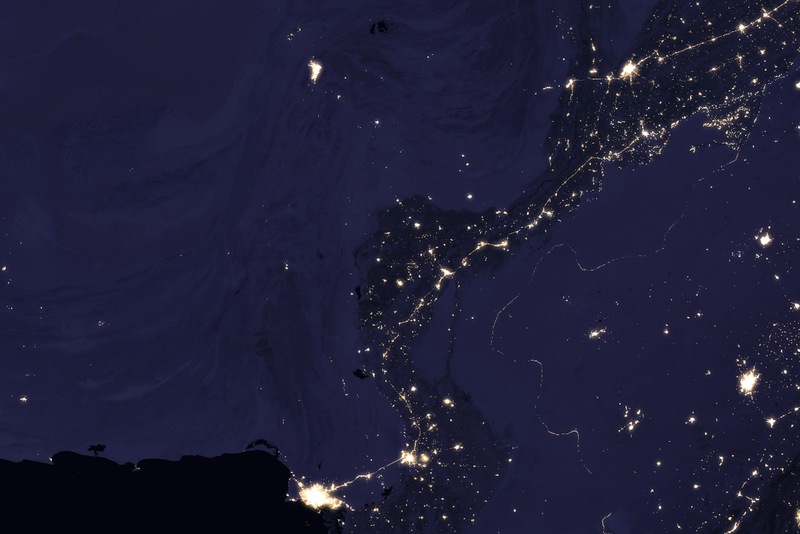 For security purposes, India has installed thousands of kilometers of floodlights along it, a feature bright enough to be seen from the International Space Station. According to news reports, Indian authorities are in the process of transitioning to LED floodlights.